Anyone who listened to radio or TV in the last month or so was bombarded with news reports about the debt ceiling crisis. We heard accusations of acting in bad faith, of ideology, and – from all sides – that the good of the American people is at stake. The latter is certainly true. But it begs the question: what is the real problem? How did we get here? This is where the majority of education spending comes from, so these budgets are the future of our children. In a recent posting on Twitter, he points to an analysis of the Federal budget deficit by Mary Meeker in a 45-minute video. Like his TED talk, Meeker explores the source of the budget problems of “USA Inc” and the options for reining them in. Neither of these presentations is scintillating – budgets don’t lend themselves to sparkling presentation. Bill Gates and Mary Meeker make a good argument that we NEED to know this information – that the actions needed are serious and will affect everyone. If we are going to vote intelligently and make our voice heard, we need to understand the situation. Gates and Meeker are interesting in another way. Within their talks, one can see elements that would support some of the arguments on all sides of the recent budget debates, from the Tea Party emphasis on cutting spending to the Democrats’ focus on the needs of the most vulnerable. Yet rather than take sides, the information tells us that the most important political decision is not between Tea Party, Republican Party or Democratic Party. It’s between those who are willing to put forward proposals that will have a real impact – even though unpopular – and those who simply stave off the hard decisions with accounting tricks and politics. Sadly, there aren’t many who are really working on the problems. I encourage you to watch for yourselves. 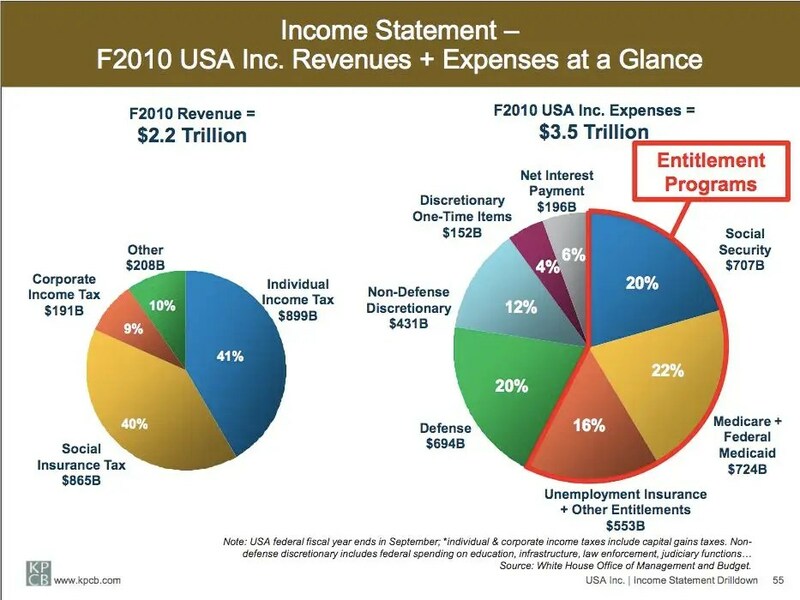 Mary Meeker on “USA Inc” – where did the federal deficit come from, why is it a problem, what can we do?